gorgeous, isn’t it? Dr. Pan Meiyun is a professor and professional photographer who has been taking pictures of the Olympic construction sites over the past two years. 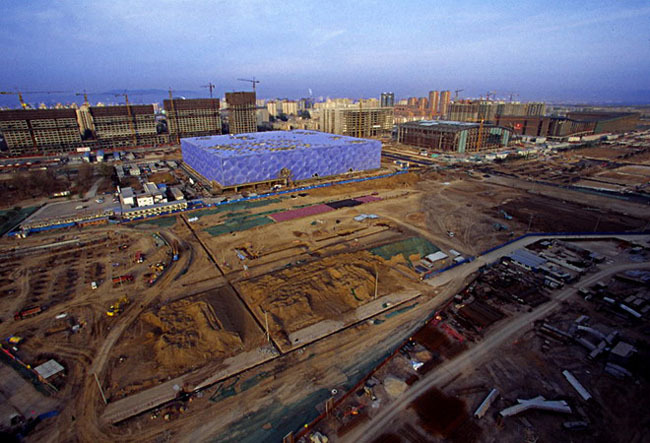 SSPhoto, a website for Chinese scenic photos, has a page of her National Swim Center, aka Bubble Building, photos. wow, I thought it’s impossible now to see clear blue sky in Beijing. Anyways, where are you from? It does seem surprisingly blue, the sky, doesn’t it?! I am from the U.S.
Lovely photo. It will be nice to see more photos of China as we get closer to the Games. More shutters going off and that sort of thing. Its amazing construction. Very very Fabulous. Keep up the excellent job.